From 50cm of water in the estuaries to the continental shelf miles out to sea, this boat is up to the task. The extremely sharp and high nose allows Bar Crusher’s Wave Slicer hull to cut though the water like a knife. The Quickflow Water Ballast System helps make these boats so popular. The self-filling ballast tank adds extra weight to the hull down low while at rest, which serves to sit the hull lower in the water and increase stability. To empty the ballast, it’s a simple matter to get the boat on the plane and the tank will empty itself. The other neat feature I really rated on this hull was the addition of a hydraulic flap that allowed the ballast tank to be shut off, stopping water getting in or out. If extra weight is needed in the hull, especially when punching through rough weather with a light cargo and small fuel load, the flap can be shut to hold ballast water to add extra weight to iron out the ride. The rear of the boat is well thought-out, with a recessed berley pot mounted in the port side rear step. The starboard side housed a very useful and well-built dive ladder. This leads onto a wide, easily removable transom door that makes entry and exit so much easier on the trailer and in the water. On the 610C, whish isn’t a huge boat, the rod holder positions allow six rods to be used down the gunnels while trolling in addition to what can be run across the back. It’s a small feature on a boat but one that any serious angler will agree with and definitely one that more boat builders should be looking at. Below this is a simple fold-down bench seat is so easy to get up and down you would definitely use it. The floor is checkerplate and while it is tough as nails, it’s bright, hard on your feet and noisy when you drop stuff on it. I definitely recommend getting some rubber matting underfoot, which is an optional Bar Crusher extra if you wish. As for the build of the boat, any join is a full seam weld and access to the areas is very functional with the bilge area easily accessible. In front of that is a large kill tank that will hold a catch of snapper or even a few tuna. The steering console is at a good height and the dash layout has all the required gear with space for more if so required. While the boat felt more comfortable to drive while standing, I am sure many people would find no dramas driving around in the very comfy Raeline seats. Shedding some light on the boat is so easy with a full deck-out of Hella equipment on the rocket launcher and some very user-friendly side lights. The waterproof Hella LED lights draw little power. The fold-down top that makes the rig easier to tow and also brings the overall height down to 2.2m, allowing it to get into most garages. Another feature is the in-floor fuel filler, doing away with fuel hoses running down the side of the boat. It also lets you use a dip stick to get accurate fuel levels. And with ample power from a four-stroke, the boat responded like a race car and it also impressed greatly in a head sea. This is often the make-or-break of a plate boat – good boats leap into the slop and cushion down on the next wave. Running with the sea the Crusher also performed very well, with no inclination to bog in at the bow when heading into the next wave. With plenty of power at the stern it was no trouble to pop the nose up for the next wave. At rest it was rock-solid, no doubt helped by the water ballast system. The overwhelming impression this boat leaves is the super way it just cuts through the waves. 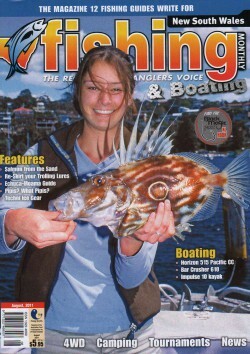 Anyone interested in a terrific bay or light offshore gamefisher should take one for a test.